Show Me The Movies: Review - Early Man - Charming and funny tale from the master of stop motion animation! 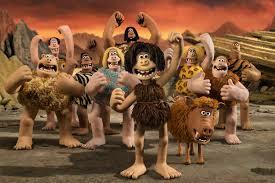 Review - Early Man - Charming and funny tale from the master of stop motion animation! In his first directorial outing since 2008's Wallace and Gromit in 'A Matter of Loaf and Death' Nick Park returns with his unique animated style and humour which gives us a gentle reminder as to why we fell in love with his unmistakable creations in the first place. Early Man tells the tale of a plucky cave man named Dug, his sidekick Hognob and the rest of their tribe as they face a grave threat to their simple existence. The evil Lord Nooth plans to take over their land and transform it into a giant mine, forcing Dug and his clan to dig for precious metals. Not ready to go down without a fight, Dug and Hognob must unite their people and form a team to defeat their enemy in a game of football. Fuelled by the voices of some landmark British actors including Eddie Redmayne, Tom Hiddleston and Timothy Spall, Park combines his special stop motion animation with an appealing story line that is full of fun, laughter and heart and is sits nicely along his excellent back catalague of family friendly films. The puns are plentiful and the action is never ending as the endearing cast give weight to what is a highly entertaining and action packed film. It may not have the complexity, subtle morality lessons (or budget) as tales seen lately on the big screen in such as the recent Pixar hit Coco but it does have an incredible sense of fun permeating through the whole production from start to finish! Laughs are plentiful and there is enormous heart at the centre of this charming movie that leaves it;s audience with that warm glow that sometimes only family films can bring. Overall, this is yet another solid, entertaining, witty and enjoyable film that can sit effortlessly alongside the very high standard of family features that are now being produced in modern times.